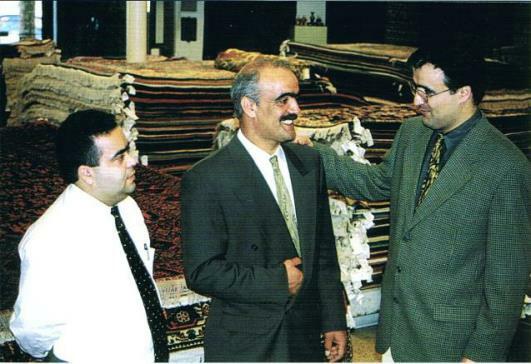 Cyrus Rug Gallery is a hands-on family affair, with the family (pictured above from left to right Payvand Shahram, Bahram Cyrus Assary and Shahram Sean Assary) operating their Ocala showroom. But what they import is carefully selected, one rug at a time. Just as each rug is a one-of-a-kind original, each one of the thousands of rugs available at any given time has been directly imported with Cyrus’ customers in mind. Cyrus Rug Gallerys showroom is the penultimate step in a long journey of an intricate business. Several times a year, the Assary brothers travel to the far corners of China, Agra (home of the Taj Mahal), Benares (on the Ganges, and the world’s oldest city in continuous existence), Turkey, beyond the Khyber Pass to seek out the master craftsmen. Here they select and place custom orders, fully aware of what the American Market needs yet at the same time sensitive to the expertise and idiosyncrasies of the weavers whose families have been in the trade for centuries.